The brand new Scorpion VX-34 Helmet takes everything that its predecessor (the VX-24) was and escalates to a entirely new level. 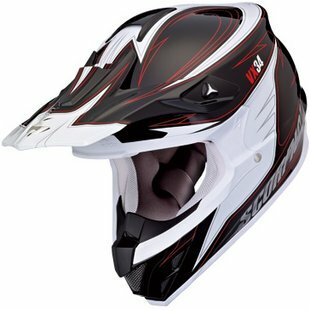 The shell has been completely redesigned, borrowing features and visual appearance from $500+ off-road helmets for an aggressive style. 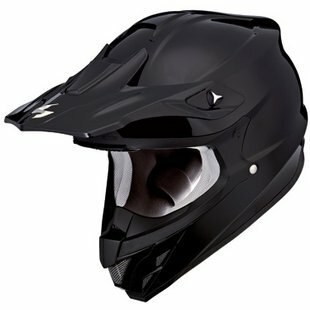 Internally, the liner and cheekpads have been upgraded, while externally we're seeing some features that we've yet to see in a dirt helmet. By pricing this lid south of $200, Scorpion is looking to capture a big portion of dirt riders who want a serious feature set in a high-performance off-road helmet but aren't looking to spend an exorbitant amount of coin. Starting off, the premium polycarbonate shell has been completely reshaped, and now bears a serious resemblance to some dirt helmets from the super-premium manufacturers. The ridges on the back provide an aggressive appearance but also a secure place for goggle straps. Scorpion has also included the AirFit air pump system, iterating on technology from a 90s shoe manufacturer, and adding an inflatable bladder behind each cheekpad, with a pump button and release button. This allows you to pump it up when the helmet is on, personalizing the fit to your cheeks, and quickly and easily release the air for helmet removal. 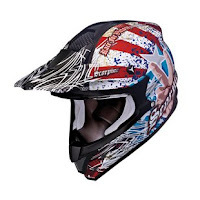 We've seen this in Scorpion's sport helmets for a while now, and it's nice to see it cross over to the dirt world. At the interior, Scorpion is now using its brand new KwikWick II cheekpads and crown liner. As with the KwikWick I, the interior is completely removable and washable. However, softer and more comfortable materials are used, and this version is antibacterial and antimicrobial, which will keep the funk out of this helmet. 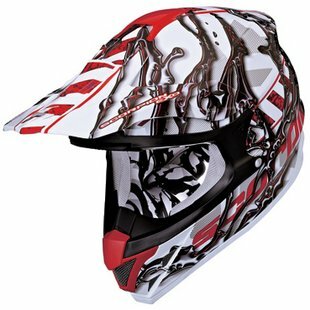 At the front of the helmet, Scorpion has made the metal roost guard completely removable and replaceable. There is a sponge dirt guard that sits behind that is removable, washable and replaceable. The replaceable roost guard is a big innovation, since rocks can easily damage this and render it less effective. It's nice to be able to swap to a new one in the event of damage. The VX-34 is now DOT & ECE certified, leaving behind the Snell standard of the VX-24. The ECE standard is comparable in safety to Snell, but allows for a lighter shell. A medium Scorpion VX34 Helmet weighs in at a svelte 3.2lbs. Ventilation has been upgraded as well, with air intakes across the brow that channel into the EPS, and a nearly-20mm top vent that is drilled right through the EPS. This feeds two rear top venturi vents and two winglet vents for significant airflow. The peak is adjustable and replaceable, and utilizes plastic bolts for its attachment to ensure that in the event of a face plant, the bolts will sheer off and peak will not cause you any damage. We're looking at mid-July 2011 release on the VX 34. The buzz has been huge surrounding this helmet so far, and our initial look has confirmed the speculation: this helmet offers excellent bang-for-the-buck and a major feature set under 200 bones. 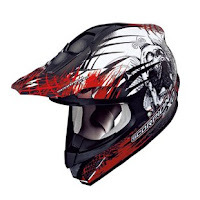 To see its competitors, visit our Dirt Helmets section.